Hey there, everyone! Look at me...all on time and everything! Tee hee! Tonight we are sharing projects using the "Ornate Ornaments" from the latest Lawn Fawn release. This is such a fun set, and you can easily go elegant or cute when using it!! Instructions: Make card from white cardstock, and round the bottom corners. Stamp the ornaments, sentiment and stars to the card front in onyx black ink. Stamp the hooks to the top of each stamped ornament using london fog ink. Stamp the ornaments to patterned paper, cut out, and adhere to the card front. Color in the ornament tops with a gray marker, and the stars with a yellow marker. Add strips of jewels to "hang" the ornaments, and accent the middles with matching jewels. Tie two bows from light green twine, and adhere to the top of each ornament. Add a clear jewel to the middle of each bow. Add glitter stickles to the stars, and then add two more jewels to the end of the sentiment to finish. This is a really cheery and bright Christmas card... super job. Thanks so much for joining us and we hope to see you again next time! Love the paper piecing! And the gem string is wonderful! A fabulous christmas card! I love the colors. Love the ga Ollie Christmas/Holiday colors. Gorgeous! Love the patterned paper and bling additions here. Great job! Oh Lea this is sooo sweet! 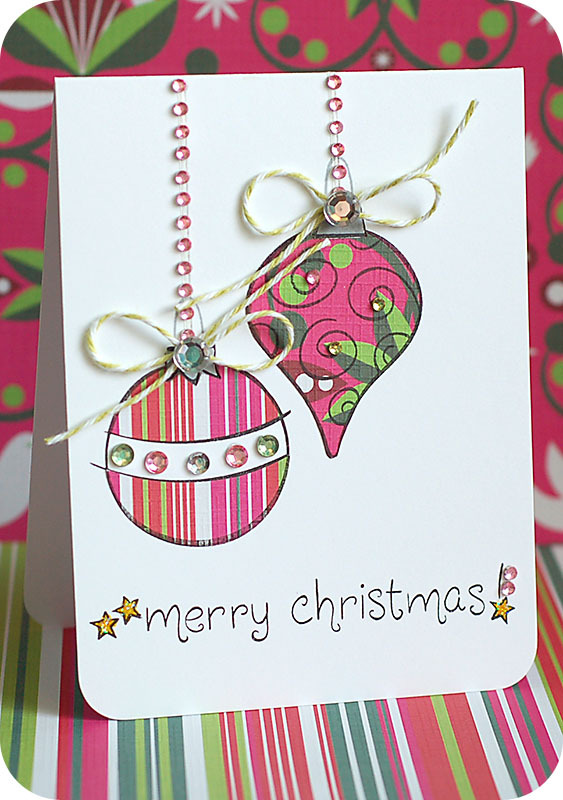 What an adorable idea to paper piece the ornaments and leave the background simple. Thank you so much for joining in on our White After Labor Day challenge at RTB this week!